One of the most useful of the many characteristics of cast resin plastics is the fact that the material can be bent under a moderate amount of heat and hold its shape. There is practically no "creep" and for that reason it cannot be deep-drawn as metal can, and it will not thin out on a bend, nor can it be "upset" or thickened by any known process. Nothing is possible but a clean straight bend or twist, and it always behaves the same under identical treatment. "Bending" includes a number of operations depending on the fact that the material softens under heat. This fact makes it possible to force oversize metal parts and fittings into a drilled hole while the material is hot, with the assurance that the part will never pull out after it cools. The commonest method of heating is immersion in water near the boiling-point (200 degrees F.) for approximately 3 minutes for every 1/8" of thickness. The material can then be held by hand and bent to shape, and cooled in the air or in cold water, or it can be pressed to the desired shape in wooden or metal forms, or in a hand-or-foot-press. Very little force is required, as it bends very easily when heated to the proper temperature, whereas it will crack easily if an attempt is made to bend it before it has reached the proper temperature or after it has started to set. 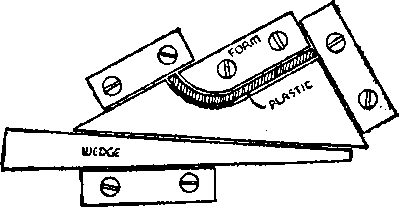 If a quantity of parts is to be bent to a specified shape, a wooden jig such as is shown in Figure 18 can be made. Fig. 18. Typical bench-jig- for bending plastics. This particular jig was used in making Project No. 9. A uniform bend on quantity work is thus assured. Water is most commonly used to heat the material, although some shops use mineral oil or various proportions of glycerine in water which evaporates less rapidly in the course of a day's work. If the material is raised above the boiling-point, or allowed to lay on the bottom of a thin container with heat under it so that the bottom surface is above boiling, it will flake off, and this flaked portion will then have to be ground off before a good finish can again be obtained. If heated in the open air at too high a temperature, it will carbonize and discolor, and in this case also the roughened spoiled material can be cut, sanded or ground off and a new finish applied. Extremely sharp bends cannot be made, as the material does not have sufficient "stretch" to go around a sharp curve without cracking. A little experimenting will show just how much a particular shape or thickness can stand before cracking. If a bend is found not to be satisfactory after cooling, the material can be heated again and bent over, and possibly a third time, but after it has been in the heat for a total of about 20 minutes, it can not be safely heated and bent again. The reason for this is that in its manufactured state, the material is not quite completely "cooked", or polymerized which would cause it to lose some of its desirable qualities. Overheating in a bending process would serve the purpose of completing the cooking, which begins to take place at 158 degrees. It is therefore just as bad to overheat as to underheat plastics for bending. This material is "thermo-setting", i.e., as the heat goes up, it first softens and then hardens, never again to be re-softened, in contrast to other types of plastics, called "thermoplastic" which soften every time they are re-heated, and can be remolded. Once cast resins are completely set, further heating only serves to make them brittle and unworkable, and to lose color. The most useful phase of this bending and softening characteristic is the tenacity with which the material will hold inserted metal fittings, such as the tang of a knife-blade, or nail-file, the part that is inserted in the handle. An undersize hole is drilled, the handle is heated to the proper temperature and the steel point forced into the hole. The material expands enough to accommodate the steel, then contracts without breaking when it cools (if the hole-size has been properly gauged), and nothing can pull it out. This process is described more fully in the chapter on Commercial Methods, and in the chapter on Findings, the same principle is illustrated in connection with the attachment of pronged jewelry fittings by this method.